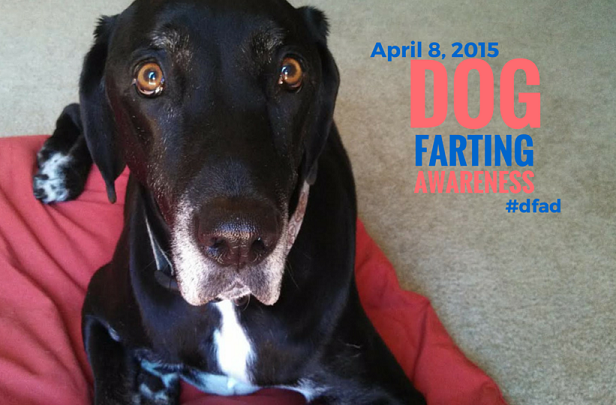 April 8 is Dog Farting Awareness Day, and my dogs and I are doing our part by spreading the word about dog farts. Dog farting is noooo joke. All dogs of all sizes, ages and breeds are affected by farting. And dog farting affects all dog owners. Anyone planning on adopting a dog must understand you are going to have to deal with some major dog farts for the next several years! And let me tell you, farts from my dogs can really clear a room! It’s not the size of the dog that determines the smelliness of the dog fart. Some dog farts are silent but extra smelly! Dog farting affects millions of dogs. If you have multiple dogs, be prepared for multiple dog farts at once (known as group farting). Does your dog have farting problems? Let me know in the comments! I didn’t come up with the idea for Dog Farting Awareness Day, but thanks to all the awareness from last year’s campaign, Ace and I are not missing out this year. Dog Farting Awareness Day even has its own Facebook page here. 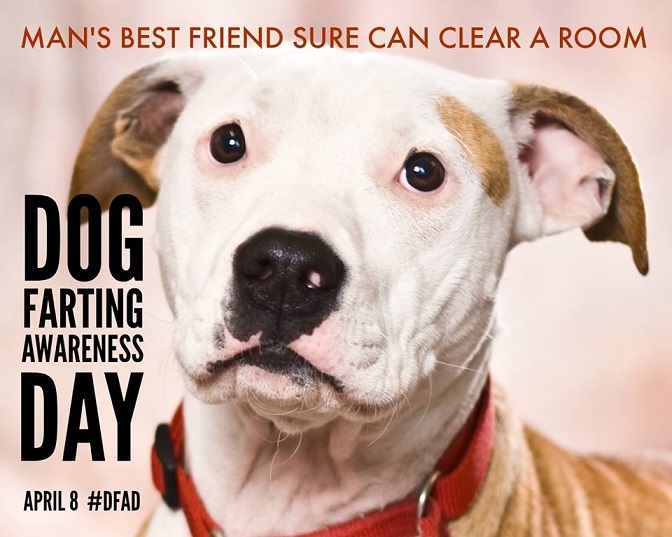 Positive campaigns featuring dogs tend to get all types of dog lovers involved, so rescue groups are also embracing Dog Farting Awareness instead of focusing on campaigns that rely on fear. My inspiration for this post came from Kim Wolf who maintains the blog and nonprofit Beyond Breed. Wolf is a pitbull owner and has spent much of her career advocating on the behalf of pitbulls and all dogs. 1. #DFAD brings thousands of dog lovers together. People from around the country are posting photos of their dogs. The majority of Americans love their dogs and view them as family members. 2. Dogs of all breeds and sizes are cherished family pets. Traditional thinking has been that certain dogs, such as pitbulls, are “unwanted” or more likely to be abused. In reality, most pitbulls are everyday, loved pets. 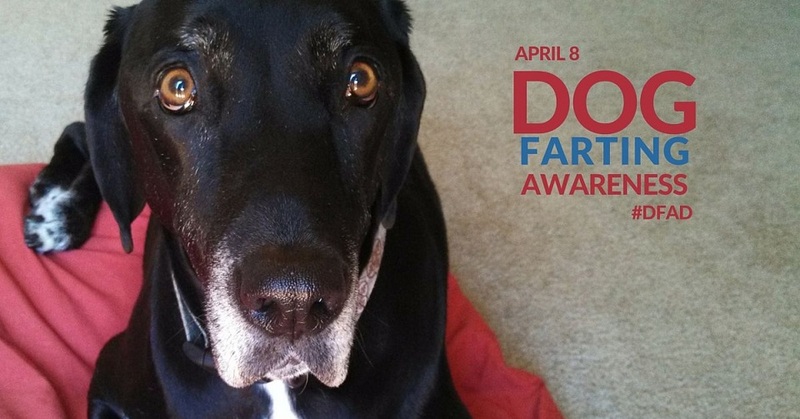 The photos and memes created from “Dog Farting Awareness Day” show this! 3. Dog-related messages spread quickly and have lasting effects. 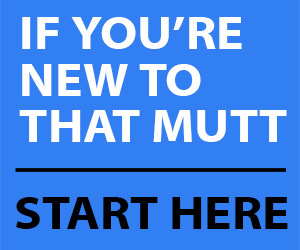 People love to share and spread messages about dogs. When we discuss more serious issues like dog fighting, we need to make sure our messages are raising true awareness and not raising unnecessary fear of certain types of dogs or their owners. Remember the common goal is to decrease negative stereotypes about pitbulls and pitbull owners. Share positive messages about pitbulls such as these. Think carefully before sharing violent or negative messages/images. 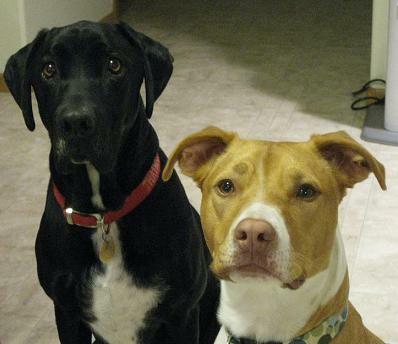 Take part in the Majority Project, and remember that most pitbulls are loved family members. Fact check messages before sharing. Is there a source for those statistics? Donate to specific, local groups with clear mission statements you support and relate to. I want to share a case study from Beyond Breed that shows how everyday dogs suffer when horrific issues like dog fighting are not put into context. It goes over a specific example where innocent dog owners were accused of “dog fighting” when there was no real evidence of dog fighting happening. Sometimes when pitbulls make headlines and a community wants to “do something,” the attempts to raise awareness actually address the wrong issues, Wolf wrote in the post. This can fuel the perception of a problem that may not have even existed to begin with. I hope you’ll read the whole thing here. 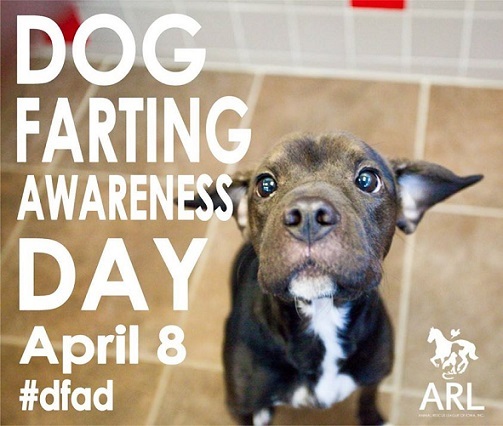 Who else is going to celebrate Dog Farting Awareness Day? Are pitbull memes doing more harm than good? This is an interesting point and I”m sorry to say I didn’t even think that dog fighting awareness day would increase the fear/stereotype that some people have for certain breeds. However, I guess if dog fighting is still going on, then people also need to be aware of it so they can help put a stop to it. But I have to admit Dog Farting Awareness Day is a lot more fun! Maybe one day that is what April 8 will only be about! Yes, I hope to at least encourage honest discussions about this topic. LOL!!! I was going to totally tell you that we learned quickly that D.O.G. and gravy chunks wet dog food do not mix!!! Disgusting!!! They would wake us up at night! Or get us up in the morning!! Mom feels extremely lucky as none of us are farters. Once in a blue moon one of us might have a tiny toot, but we never clear rooms or have those issues. We don’t know why it is so, we are just thankful. I cannot stop laughing. But love the message behind it. Anyway, certainly glad no one farted when we were at a Shih Tzu party I just wrote about! Haha! Ranger likes to fart when he’s begging for food. What a disgusting creature. Good thing he’s cute. we have a greyhound and she farts when she stretches. My boyfriend had a boxer and when she did O M G you got your nose burned out. They ate beef flavored food and I changed to lamb and rice and she calmed down a lot . As you know if your f. something is not right so learn what causes it . I think my doggo farts more than usual. Should i be worried?